"Get all of the s'mores yumminess without leaving the kitchen! 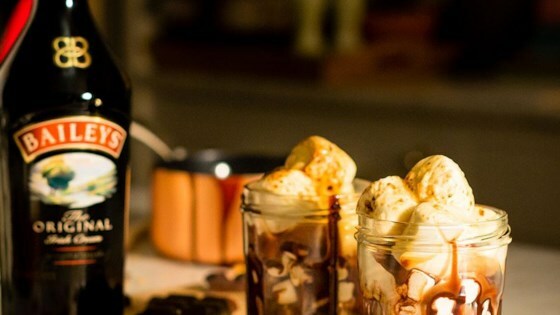 Just fill a jar with graham crackers, marshmallows, chocolate and you guessed it--Baileys Original Irish Cream!" Crush and then layer graham crackers at the bottom of a mason jar or cup. Add a layer of mini marshmallows and chocolate sauce (proportion and layer to your taste). Top with a few large marshmallows. Drizzle 3 oz. of Baileys Original Irish Cream on top for a sweet finish. Brown marshmallows with a creme brulee torch. Rach and cocktail expert Mary Giuliani make decadent Baileys milkshakes. Stay Stylish, Drink Responsibly. Baileys Irish Cream Liqueur. 17% Alc/Vol. Paddington Bottling Co., Norwalk, CT.
Great concept but a little strong. We would have preferred a recipe that had a little more detail.